Sweden’s minister for defense Karin Enström, slammed by human rights organizations for refusing to call Saudi Arabia a “dictatorship”, has been forced to change her mind on the issue. “We don’t make up lists of countries, but it is clear that it isn’t a democracy,” Enström told national broadcaster Sveriges Radio (SR) on Monday morning. Saudi Arabia is once again at the very top of organization Freedom House’s list of the “Worst of the worst” most repressive societies. There are no general elections in the country, women are not allowed to drive a car and flogging and amputation are generally approved penalties, according to daily Aftonbladet. However, Sweden continues to export weapons to the country, something that many human rights organizations have questioned. “We don’t make lists of countries and in this case, when you evaluate a country in order to decide whether to export arms or not, there are a number of criteria that need to be met,” Enström told SR.
She was unwilling to answer whether or not, arms export aside, she viewed Saudi Arabia as a dictatorship. “We don’t make this distinction between countries, but of course it is safe to say it is a very authoritarian regime,” Enström said. According to the head of the human rights organization Civil Rights Defenders, Robert Hårdh, the minister’s unwillingness to call the country a dictatorship is peculiar. “When it comes to Saudi Arabia it really isn’t a question of a borderline case, it is an obvious dictatorship,” Hårdh told SR. According to Hårdh, the hesitance to use a word like “dictatorship” could be due to the unwillingness to make other business interests more complicated, like arms exports to the country in question. “These ventures become more difficult if you use a strong word like dictatorship,” he told SR. In the foreign ministry’s description of Saudi Arabia, the word “dictatorship” isn’t used. Instead it states that the country is “an absolute monarchy without an elected, democratic representation or political parties”. The word “dictatorship” isn’t used about Cuba or North Korea either, according to news agency TT. 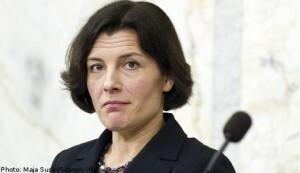 However, Enström was on Monday criticized for her unwillingness to use the word “dictatorship”, both by members of the opposition and by her own government colleague, minister for education, Jan Björklund. “Saudi Arabia is one of the world’s worst dictatorships and there should be no confusion as to Sweden’s stand on that,” he told TT. Later on Monday, Enström did a U-turn and issued a statement clarifying the government’s position. “Saudi Arabia is an authoritarian regime and an absolute monarchy, where serious crimes against human rights are committed. The government does not sort the countries of the world into democracies and dictatorships but if one can only choose between describing Saudi Arabia as a democracy or as a dictatorship, Saudi Arabia should be described as a dictatorship,” she wrote. NO, Saudi Arabia a dictatorship!!!? AL AAOUZOUBILLAH !!! Not only a dictatorship, the most backward country in the WORLD, the first producer of terrorists in the WORLD and their biggest funder, the most ignorant country in the WORLD, the only country int he WORLD where women are counted as next to animals, etc, etc, etc…… ALL THAT BY DECREE FROM GOD !!! I would have liked your comment if you didn’t put the word god and zub like that. Hhahahaa .. yes … but a friendly one. Too bad for their citizens, but they are not trying to take over the rest of the world. The house of Saud is quite comfortable. And the men can go peel rubber in the dessert with fancy cars. It’s nice.